Can Vacations Make Kids Smarter? There are many places to visit for a Thanksgiving trip, ranging from snowy mountains to sunny beaches. But, if you’re looking for an authentic Thanksgiving vacation, visit Plymouth, Massachusetts, where the Pilgrims first stepped foot on America's shores in 1620. Spending time with the Pilgrims will be a Thanksgiving your youngsters will never forget. 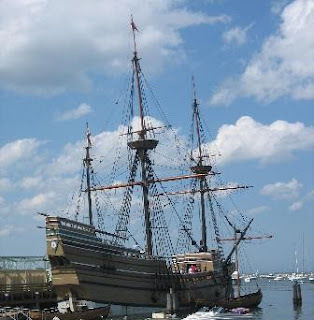 The modern town of Plymouth, the oldest continually inhabited settlement in the United States, has a population of almost 60,000, but there are plenty of places to explore in and around the town that will transport you back to the Mayflower, including the Mayflower II (a full-size replica of the original Mayflower). Located in Plymouth Harbor, this sea-worthy ship is a museum showcasing the pilgrim's arduous ocean crossing. You'll be surprised when you see how small a vessel the Mayflower really was. Plymouth Rock itself, the traditional stone on which a pilgrim's foot is said to have first stepped in the New World, is housed in a granite canopy memorial, and is the centerpiece of the Pilgrim Memorial State Park. Another monument, on nearby Cole Hill, is a sarcophagus containing the remains of 51 of the pilgrims who died during the harsh winter of 1620. Located at Plymouth Center, visit Pilgrim Hall Museum, the oldest public museum in the country. Nearby, the National Monument to the Forefathers, dedicated in 1889, is the tallest free-standing granite monument in the United States. For an authentic taste of seventeenth century life, don't miss Plimoth Plantation (the historic spelling of "Plymouth") just south of Plymouth Center. With the help of role-playing tour guides your family will be immersed in the world of our country's forefathers. A fascinating living-history museum, it re-creates a 1627 fortified town and a Wampanoag homesite. A farm homestead complete with live animals is sure to delight the children. To get the full impact of our historical ties to the Pilgrims and the first Thanksgiving, plan to take the time to explore not only Plymouth, but also the colonial history of the surrounding area, including Boston. Rent a timeshare which will give you a "home-base" and set out on these fascinating historic trails. Many budget-friendly Boston timeshares are available and are only an hour's drive from Plymouth, or stay at a Cape Cod timeshare, just 30-minutes away. This is truly a Thanksgiving vacation that will thrill the entire family. Thanksgiving generally brings visions of frost on the pumpkin, but the reality is that where there is frost, there is cold weather. Why not consider the beautiful desert state of Arizona for a warm weather vacation. Arizona is well-known to retirees as the smart destination for a warm winter. The cities of Phoenix, Scottsdale and Tucson are very popular for winter vacations that include the Thanksgiving holiday. If you want the warm weather without the crowds, one of Arizona's best kept secrets is Lake Havasu. This year, think about celebrating Thanksgiving with the family basking in the sun and boating on crystal clear waters. With more than 400 miles of shoreline, Lake Havasu was created when the Parker Dam was built in 1938 across the Colorado River, providing exceptional recreational opportunities. Best known for boating, (there are many boat rental companies), and fishing, (guided or on your own, for bass, trout and catfish), Lake Havasu is still much more. Rent a timeshare in Lake Havasu City, right on the water's edge, and spend a week exploring all there is to do in this beautiful area. Lake Havasu's most famous focal point is the London Bridge. Yes, the actual bridge that once spanned the Thames River in England is now enjoyed by 2.5 million visitors a year in Arizona! And the youngsters will thrill to see bighorn sheep, coyotes and over 200 species of birds at the Bill Williams River Wildlife Refuge and the Havasu Wildlife Refuge, both within easy driving distance of Lake Havasu. For an exciting family adventure, tour the lake and the magnificent surrounding desert by plane. You can take your choice of flying in a seaplane, or in a WWII Stearman bi-plane (with an open cockpit!). Or imagine gliding above the countryside in a hot air balloon! (Available October through May). A fun game for the entire family while boating is to look for the 15 lighthouses that dot the shore of the lake. Well, these lighthouses are actually only 1/3 scale, but they are replicas of famous lighthouses across the country. The day after Thanksgiving be sure to head down to the London Bridge for the "Festival of Lights" where over one million Christmas lights will decorate the area to get you in the Holiday mood. You'll want to pinch yourself as you enjoy your Thanksgiving dinner outside on the deck of your Arizona timeshare unit, where the air is soft and warm, while half of the country is wrapped in woolens! 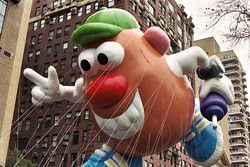 Have you ever wondered what it's like to see the Macy's Thanksgiving Day Parade in person? Why don't you plan a family vacation to New York City this Thanksgiving and find out! The Macy's Thanksgiving Day Parade first marched out 85 years ago when a group of Macy's employees took to the street with balloon-decorated horse-drawn floats and live animals including camels and elephants. This first parade was called Macy's Christmas Day Parade, although it was held on Thanksgiving Day. Santa Claus drew the crowd to the Macy's store where he unveiled the famous Macy's Christmas windows. The first helium balloons went up in the 1928 parade. But they all exploded because it had been forgotten that helium expands with altitude! The balloons were redesigned, and return address labels were attached for prizes that Macy's offered for the return of the balloons. In 1958 a helium shortage saw the balloons being brought down the street on cranes. And 1985 was the first year to have a snowstorm on Thanksgiving - but true to "show business" tradition the parade marched on! For an exciting experience the family can watch these giant balloons being filled with helium the night before the parade. On Thanksgiving Eve join the crowds outside the American Natural History Museum and see this awesome transformation. By the way, in 1975 the Dino the Dinosaur balloon was inducted into this museum as an honorary member! This can be a budget-friendly trip for your family by renting a timeshare for the week. You can find timeshares available right in downtown NYC, and besides saving money on the room, by using the fully-equipped kitchen that's included, you can save on meals out as well. Except, of course, as a real treat enjoy that all important turkey dinner at one of NYC's many restaurants! See all New York City Timeshare Resorts. For information on the parade route (it's a new one for 2009) and tips on viewing the parade from families who have been there, visit the Traveling Mamas Blog. When most of us plan a fall trip to view colorful Autumn Foliage, we naturally think of the New England states, with their stunning scenery - and maple syrup - both world-renowned. But for half of the country, New England is a long way from home. For a travel destination that is easy for just about everyone to reach, think of Wisconsin. 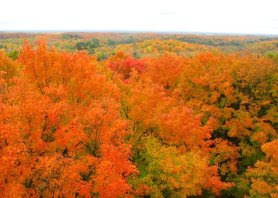 In the Autumn this mid-west state is also covered with spectacular color, starting in the north about mid-September. The color generally doesn't peak in the southern part of the state until late October. Since Wisconsin is covered with woods and forests, you'll always be surrounded by beautiful Fall color. And there is plenty to do in this versatile state. On the southeast peninsula in famous Door County is Egg Harbor. Surrounded by hundreds of miles of shoreline from Green Bay and Lake Michigan, this area is popularly known as the "Cape Cod" of the Midwest. 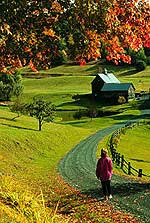 On Columbus Day weekend enjoy the Pumpkin Patch Festival, timed to occur as the fall colors begins to peak in this area. Just 35 miles from Milwaukee is Old World Wisconsin, the largest outdoor museum of rural life in the United States. Covering 600 acres, it has over 60 historical structures, ranging from farmsteads with houses and out-building, to crossroad villages. From September to the end of November, this remarkable living history museum offers a variety of "Fall Workshops." Adults can enjoy learning spinning, or blacksmithing, or "Autumn Harvest" basket weaving, while youngsters will be entertained with a "Little House Quilting Project," and even wood-stove cooking. A great way to enjoy a colorful Fall vacation in Wisconsin, whether as a family, or maybe with several retiree friends, is to rent a timeshare. Timeshares are roomy, relaxing, and can be quite inexpensive. The kitchen will give you a chance to hone your culinary skills with Wisconsin's delectable cheeses. And did you know? - Wisconsin has its own famous maple syrup - delicious on your morning pancakes! See all Wisconsin timeshares. A recent study shows that vacations can actually make kids smarter! The U.S. Department of Education has published a study showing that children who travel over the summer school break actually did better in reading, math and general knowledge than their peers who did not take a vacation. "The data is clear - and gives hard-working parents another reason not to put off a summer vacation trip” said Dr. Bill Norman of Clemson University. "Providing kids with the experience of travel broadens their horizons and opens up their minds to learning." The study went on to prove that children who traveled during the summer scored higher on academic achievement assessment tests than those who did not travel. The average number of days spent on vacation for these subjects was 11.8. It is also important to note that children who visited plays or concerts for cultural enrichment, art or science museums, historical sites and locations, beaches or lakes, national or state parks, and zoos or aquariums also had significantly higher academic achievement scores than those who did not experience such locations. "The timeshare industry has always touted the importance of regular vacations for health and wellness," says Howard Nusbaum, president and CEO, American Resort Development Association (ARDA). "This study gives families yet another strong reminder that taking vacation has benefits beyond the actual week or two of vacation." See Howard explaining more on YouTube. This information perfectly supports the reason why owning a timeshare is of such a great benefit. Not only are you paying for your vacation in advance, guaranteeing you’ll take one, timeshare resorts have so much more to offer the family traveler than just a standard, one room hotel. With additional room(s) to spread out, (living space plus bedrooms), the in unit kitchen to save money on meals and the great kid-friendly amenities, it’s obvious why timeshares are the best place to stay for family travel. If you have not experienced a timeshare vacation before, make it a point to try timeshare rentals. You’ll be glad you did. And once you do, you may even decide to buy a timeshare resale for yourself! Now that football season is in full-swing, fans can start dreaming about going to Super Bowl 44, held in Miami, FL, on February 7, 2010. There are lots of good reasons why this is the 10th time Miami has hosted the Super Bowl. What better place to travel in February than somewhere that is deliciously warm (average February temperature is mid-70's) and has 15 miles of beaches?! If you're one of the lucky ones whose team makes it to Miami, and you get tickets, plan on a real vacation there so you can enjoy not only exciting football, but the many other fun things to do in south Florida. Sun, sand and surf are only part of enjoying the beaches of Miami. Two Key Biscayne parks offer something different. Visit Bill Bagg's Cape Florida State Park where you can climb the 109 steps up to the top of the lighthouse that was built in 1825 - the oldest standing structure in Miami-Dade County. Or enjoy the sparkling white sands of Crandon Park Beach and picnic in the Crandon Gardens where native birds, turtles and reptiles run freely. For a break from the waves, plan on visiting the Miami Metrozoo. It has over 300 acres and features a white Bengal tiger, as well as the Caribbean Flamingo Lake, and a children's petting zoo. For a really exotic experience walk the mile of trails at Parrot Jungle Island, and get up close and personal with the many colorful parrots, macaws and cockatoos. Don't miss the Miami Seaquarium with it's marine life exhibits and daily whale and dolphin shows. And, of course, when you're in Miami you must plan at least a day to experience the incomparable Everglades National Park, just 20 miles from the city. The 1.5 million acre wilderness reserve has been designated a World Heritage Site, an International Biosphere Reserve, and Wetland of International Importance. Enjoy over 150 miles of canoe, kayaking and walking trails that allow you to get close to the mangrove swamps, water channels through sawgrass prairies, and see the many animals that call this special place home. For a comfortable and budget-friendly stay in Miami, consider renting a timeshare. If you are bringing the family, or are buddy-ing up with friends, a timeshare offers you relaxing space (multiple bedrooms, a living room, and usually a deck or balcony), plus a kitchen for savings on meals. Add to that the resort's amenities that are included, and your Super Bowl Miami vacation will be off to a rip-roaring start! See all Florida timeshare rentals. The 21st Winter Olympics will be held February 12-28, 2010, in the host city of Vancouver, British Columbia, Canada. Most venues will be in Vancouver, with some alpine events being held at Cypress Mountain, 30 miles from Vancouver, and the Whistler/Blackcomb ski area 85 miles from the city. There will be bus transport from the city to both of the outlying mountain venues. Rare for a winter Olympics host city to sit at sea level, Vancouver is a major seaport with a busy international harbor. Renowned for its stunning natural scenery, the city of Vancouver is located on a peninsula, although it is shielded from the Pacific Ocean by Vancouver Island. The North Shore Mountains rise in dramatic contrast to the ocean inlet, giving an awesome backdrop to the city. Vancouver is busy setting records for a host city. It is the most populous city to ever hold the Winter Olympics at 3,000,000. It is the warmest ever for the Winter Olympics, with an average wintertime temperature of 40 degrees (F). The 2010 opening ceremony will be held indoors, a first for either the Winter or Summer games, at the Richmond Olympic Oval. Since that is a covered stadium, another first will be the lighting of the Olympic flame indoors. The flame must burn continually for the 15 days of the Olympic games, causing speculation on how the indoor environmental issues will be managed. If you are thinking of traveling to the 2010 Winter Olympics, now is the time to start planning. Accommodations are going fast. An alternative to the hotels is renting a timeshare. At this writing there are still a number available during the Olympics both in Vancouver and at the Whistler/Blackcomb ski area. Timeshares are more economical than hotels, offer more living space, and come with kitchens to also help save in the cost of meals. Timeshares are a great alternative for families, as well as traveling groups. 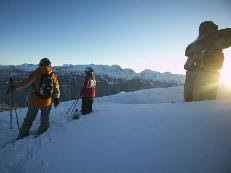 For you skiers, this is a wonderful opportunity to visit British Columbia’s famed Whistler/Blackcomb ski resort. When the two resorts combined in 2002 it created the largest ski area in North America, 54% larger than second place Vail, Colorado. Although Vancouver sits at sea level, and Whistler Village is only 2, 214 feet above sea level (much lower than most avid skiers are used to! ), the ski trails top out at 7,000 feet. The area gets an average of 400 inches of snowfall per year. Vancouver is a cosmopolitan city with trendy shops, multi-ethnic restaurants including Indian, African, Greek and Thai, with world class chefs, and the largest urban park in the world, Stanley Park. If the Olympic games don’t keep you busy enough, the many things to do in Vancouver will, for a trip you’ll never forget. Check the official web site for the 2010 Winter Olympics, for all important updates and information. See all Canada timeshare resorts. Snow in sunny California? Well, of course, at Disneyland all kinds of magical things are possible! Plan a family vacation to Disneyland anytime between the end of November and the first part of January, and you’ll experience Disneyland’s magical winter wonderland during their Christmas holiday season. Can you imagine Sleeping Beauty’s Castle covered in snow? Icicles forming on the turrets and glistening from the peaks? This is just the beginning of a sparkling Disneyland as the excitement and joy of the holiday season transforms the famous park. Christmas decorations adorn most of the attractions throughout each Land, (many of them in a “Mickey Mouse” shape, of course! ), with the 60 foot Christmas tree at Towne Square as the spectacular centerpiece. Carolers, dressed in wonderfully authentic “Dickens” costumes, stroll through the park singing Christmas songs that give everyone that special warm snuggly Holiday feeling. With Christmas music as a backdrop, hot cider is served, and your kids can decorate Christmas cookies on Main Street and in New Orleans Square. Of course Mickey and Minnie and all of their friends are decked out in their Holiday finest. Many of the rides have special Christmas accents too. It’s a Small World is decorated with 300,000 Christmas lights, and the multi-national characters of the newly renovated ride sing “Jingle Bells” in an array of different languages. “A Christmas Fantasy Parade” is the traditional daylight parade featuring all of your family’s favorite Disney characters along with dancing snowflakes, Christmas trees and gingerbread men. After dark is the “Christmas Candlelight Procession” on Main Street. This moving experience features a full orchestra and chorus performing traditional Christmas songs, along with the Christmas Story which is narrated by a different celebrity each year. For your grand finale – the spectacular fireworks display choreographed to traditional Christmas music. I defy you to watch this fabulous tribute to Christmas by Disneyland without getting goosebumps and a tear in your eye! Especially at the end when snow starts softly falling over Main Street and New Orleans Square to the beautiful tune of “White Christmas.” What a terrific experience for the entire family! How can a family afford such a fantastic Holiday vacation in these economic times? Think about renting a timeshare. For a fraction of what hotels cost, you can have lodgings that give you multiple bedrooms and a living room. A full-sized, fully-equipped kitchen is also included, which saves budget-minded families on the cost of meals. See a list of Anaheim timeshares here. 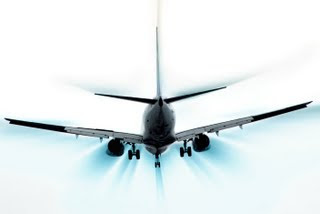 As you take your annual vacation to your timeshare resort this year, you may need to board an airplane to reach your final destination. The Transportation Security Administration (TSA), has worked hard to implement the airport security measures we all need, and at the same time to try to make our flying experience a pleasant one. With this month marking the 8th anniversary of 9-11, we are all reminded again of how the measures put in place by the TSA help us all and keep us safe. So, what are the latest rules all airplane passengers need to know when traveling? The “3-1-1 Rule”. If you do not want to check your luggage, the largest amount of liquids, gels and aerosols you can carry on board is 3 ounces. The “3-1-1” rule makes it easy to remember that you can carry on three (3) ounces, inside of one (1), one (1) quart zip-top bag. Simple. The TSA has also been spending these past eight years developing new and better scanning equipment. It’s much more sophisticated now, and few people are stopped, allowing the security check lines to flow well. An exciting new scanner just being implemented by the TSA is the CastScope. This new scanner allows airport staff to easily examine casts, bandages, a brace, or even a prosthetic device, all while maintaining the dignity of the passenger. Now a passenger doesn’t have to lift clothing off of these items, nor does a prosthetic device have to be removed. Also gone are the days when knitting needles were confiscated from little old ladies. You can take your knitting needles and nail clippers on board, and even scissors as long as they are wrapped securely and in your carry-on luggage. The wrap on the scissors is to prevent injury to TSA personnel who may need to search your bag. On its blog site, the TSA states, “One of the primary goals of the Transportation Security Administration is to provide the highest level of security and customer service to all who pass through our screening checkpoints.” Check out the user-friendly and very informative TSA blog for all of your airport security questions. The outrageous colors of the Autumn leaves in New England can almost hurt your eyes! It’s like you stepped right into a painting because it’s so gorgeous you can’t believe that it’s a reality. If you have not yet discovered this for yourself, plan a family vacation to New England this Fall and experience the colors for yourself. New England is composed of six states: Maine, Massachusetts, Vermont, New Hampshire, Rhode Island and Connecticut. The professional leaf watchers say that “Peak Color” is hard to pin down exactly – that’s because when the leaves turn color depends on things such as the amount of sugar in the leaves, rain, and, of course, temperature. The coloring starts in the north, as temperatures begin to dip, and move south. So, you can pretty well figure that for New Hampshire, Vermont and Maine, peak can be from the last week of September to the first couple of weeks of October. Around Columbus Day is generally considered peak for Massachusetts and Connecticut. Of course, there are no guarantees, so you may have to wait a day or three. If you rent a timeshare for a week, it’ll be easy to wait. And you’d be smart to have a few other things planned to do while you wait, and that’s easy, too! Try apple picking! Each state has a number of family-run orchards where you are invited to pick juicy, sweet apples right off of the tree! A number of them also offer hayrides, as well as apple cider, freshly baked apple goodies, and handmade crafts. Or take your pick of Fall Festivals. For example, there is the Fall Foliage Festival in Northeast Kingdom, Vermont, the Sunday River Fall Festival in Newry, Maine, and the Keene Pumpkin Festival in Keene, New Hampshire, just to mention a few. The easiest, most economical, and really fun way of having a “leaf peeper” trip with the entire family is to rent a timeshare. There are many available through-out all six states in the New England area. A timeshare gives your family a home base from which day “road trips” are easy to take – to drive out into the countryside to immerse yourselves in autumn color, to travel across covered bridges, to attend the festivals and to gather pumpkins and apples. At the end of the day you can look forward to relaxing where there is enough space for the kids to run around, and then, of course, there’s the resort’s many amenities to enjoy. Many timeshares in New England also come with fireplaces, and all have fully-equipped kitchens for savings on meals. All of this for a price that is typically up to 50% that of hotel rates. Sharing New England’s autumn splendor with your youngsters is a memory-making experience not to be missed! Planning a ski trip with the family? Everyone knows that Breckenridge, Colorado, is home to world-class skiing. But, bring the family to ski Breckenridge, and you’ll discover an historic town with exciting things to see and do for a truly memorable family vacation this winter. Breckenridge began during the Pikes Peak Gold Rush of 1859 when prospectors entered what was then part of Utah Territory. Today there are relics of the town’s mining days for visitors to see, and mine shafts 1000 feet into the ground to tour. The Country Boy Mine conducts tours in winter, with reservations. The Heritage Alliance has recently renovated a log cabin that was built in 1875, which features fun interactive exhibits and a small viewing room with a film about Breckenridge’s exciting historic first days. They also offer winter tours of the town, with reservations. And there’s more fun waiting for your family outdoors. Dog Sledding – yes, you can actually ride on one! What a unique experience for the entire family! Ice Skating – both indoor and outdoor. You can glide (or attempt gliding!) on two indoor rinks, or on Maggie’s Pond. Ever tried snowshoeing? There’s a trick to it! Lessons, and rentals, are available at two Nordic centers, each with groomed paths. Then there’s wild sledding down the famous hill at Carter Park. How about snowmobiling on a guided tour to a ghost town? And you won’t believe this – Fly Fishing in the winter! Guided trips are available. What better way to finish up the day than with a dinner Sleigh Ride! To the joyous jingling of the horse’s bells you ride to a camp where dinner is cooked over a camp stove while musicians entertain you. If you want that to be a romantic ride, you can send the youngsters to “Kids’ Night Out!” for some fun on their own. All of this, plus exhilarating skiing, and you’ll be ready to head “home” for rest and relaxation. The best type of lodging for this is a timeshare. Renting a timeshare gives your family space to really sprawl out because you get multiple bedrooms, and a living room. A fully-equipped kitchen is also included, and all of this for a cost that can be a fraction of hotel rates. See these Breckenridge Timeshare Resorts for a listing of timeshares available for rent. Have family fun this winter. The treats start with Goofy’s Candy Corn Acres, where you’ll see candy corn horticultural “marvels” such as candy corn carrots and candy corn pumpkins. And the treats continue with Mickey’s Trick or Treat Party on specified days in October. Included are treat stations and activities such as “Creepy Crafts.” This is a “private” party only open to special ticket holders – and anyone can buy a ticket! Could the Tower of Terror be more frightening? During the Halloween holidays anything is possible. This terrifying place will be decked out in ghoulish Halloween décor, and there just might be some, umm, “visitors” lurking around the lobby that you’ll want to watch out for. A family vacation with all of these Disneyland Halloween delights can be quite affordable if you stay in a timeshare. Renting a timeshare can save you up to 50% what hotels cost. Besides offering more than one bedroom and a living room, full-sized kitchens are also included, helping budget-minded families with meal costs. See this resource for Anaheim timeshares rentals. Oh, and remember to wear your Halloween costumes when you go! “Snow’s Up!” Every avid skier is well-aware that Ski Season is fast approaching, and guess what? It’s easy to turn a ski trip into a family vacation! Jackson, Wyoming, the major gateway to the Grand Teton National Park, is the place to be for any serious skier, or serious skier wannabe, and is great for family travel. World famous ski conditions here are amidst some of the most stunning natural beauty your family will ever see. The kids are sure to remember their first site of the Grand Tetons. Seeing the Grand Teton mountain range, rising sharply and dramatically from the valley floor, nearly knocks the breath out of you. The area is called Jackson Hole for the “hole” it sits in surrounded by breathtaking mountains. And those mountains are the source of the exhilarating skiing that has made the Jackson Hole area the ski destination of choice for skiers from around the world. The Snow King Resort is so close that the slope swoops up almost from the middle of town. A challenging course, it’s also night-lit! Try night skiing if you never have – it offers an ethereal, almost mythical experience. 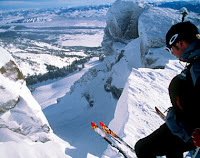 The famous Jackson Hole Ski Resort is out of town only 12 miles. Its spectacular deep powder skiing is unrivaled. Beginners and intermediate skiers are soon strutting their stuff on a variety of groomed runs. Advanced skiers have many different runs designed to challenge and exhilarate. Perfect for the family, this resort even has their Wrangler Day Care for children 6 months to 2 years, and the Kid’s Ranch that offers age-specific activities, including ski and snowboard lessons, for youngsters up to 17 years. Take a break from the slopes and sample some of the other things to do that Jackson has to offer. Just a short drive out of town is the National Elk Refuge. Created as a winter home, you’ll see the largest concentration of these magnificent animals in the country. Many times these huge beasts (males average 500 pounds and can be 5 feet at the shoulder) are lounging along the fence line right beside the road. Talk about “up close and personal!” it’s an experience never to be forgotten. And you can even tour the Refuge in a sleigh ride! To make your ski trip to Jackson Hole an easy one on the family budget, great places to stay are timeshares. There are several for rent in the Jackson Hole area. See Jackson Hole Timeshare Resorts for a listing. Once you’ve experienced staying in a timeshare with your family, you’ll be hooked. Offering bedrooms – pleural! – and a living room, there’s plenty of room for the family to sprawl out and the kids to run around. The full-sized, fully equipped kitchen allows for meals that are easy on the pocketbook. Of course, splurging at one of Jackson’s many trendy restaurants once in awhile is okay, too! 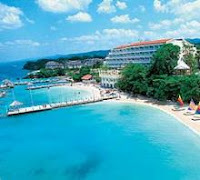 Jamaica is a wonderful vacation destination. A beautiful, big island in the Caribbean, (140 miles long in fact), with stunning white sandy beaches and azure seas. Sounds like paradise. Deliciously exotic with a kind of down to earth practicality thrown in. Here’s just a taste of all there is to do for the vacation traveler. Kingston is the capital of Jamaica, on the southern edge of the island. You can visit the museum of the famous reggae singer Bob Marley while in Kingston. Port Royal is the famous hang-out for all of those dastardly pirates a few centuries ago. It was founded by the British, who began fortifying the settlement next to the deep harbor that now holds as many as 500 ships. On the NW coast of Jamaica, Montego Bay is “where the parties never stop” according to the Jamaican Tourist Board. But, there are also wonderful sites to see like: Dunn's River Falls, 600-foot waterfall. A very striking site, with the mountains surrounding it. Or, swim with the dolphins at Dolphin Cove. You can even sail through the air above the canopy of the rainforest on a “canopy tour”. Visitors are provided with a helmet and a harness, then you are attached to ropes rigged between platforms and you whiz through the sky across the tops of the trees and ferns! Can anything get more fun that that? Here’s something very unique you might enjoy. The Jamaican Tourist Board has sponsored a program called “Meet the People”. Sign up, and you get to spend some time with a “host” family sharing a meal in their home, attending church with them, or enjoying a picnic on the beach. This is a great way to get to know the real Jamaica!